In a bookstore you do not have to search for too long before locating a large proliferation of fitness books and in most cases they all contain the same messages and guides. But Shane Fitzgibbon, a kick-boxing and tae-kwon-do athlete, has just released an offering that aims to offer the reader more than the average health and fitness book. Mr Fitzgibbon’s sporting profile alone is his qualification for writing this book. He is a decorated martial arts competitor and his years of intense training equips him with the authority to direct fitness enthusiasts in the right direction. His career, which dates back to 1987, has heralded a mass of international titles including European, intercontinental, and world tournament victories. He has captained Irish and European kick-boxing teams to glory and also captured the Grand Champion title at the World Martial Arts Championships in 2000, where he defeated fighters from different categories. 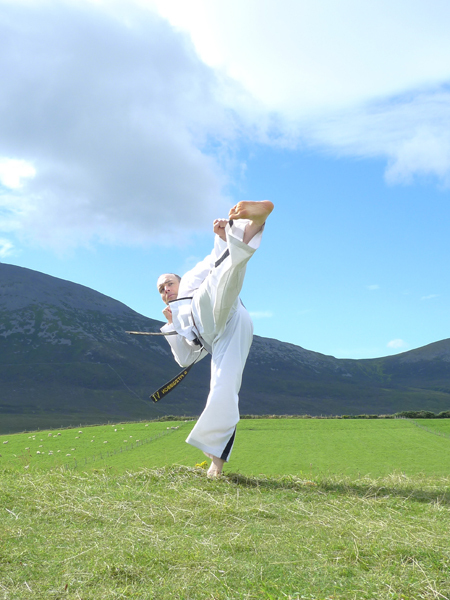 He holds a science degree from NUIG and is a member on the executive committe of the Irish United Tae-Kwon-Do Federation. According to Mr Fitzgibbon, athletes need to abide by certain fundamental exercise rules such as maintaining a balanced diet and training regime, planning, and periodization. “Plan your work and work your plan. It’s essential that you have a strategy before you start training. A lot of athletes neglect a thing called periodization, and what that means is that your training programme needs to change with the seasons.” Although Shane Fitzgibbons’s association with the sporting world is primarilly participation, he was also a regular sports columnist for Galway First. With all these facets compiling his sporting exerptise, anyone who wants to improve his/her fitness and general wellbeing can rely on the instructions of Training and Optimal Health for Sports. It is currently retailing in all bookshops at €24.99.